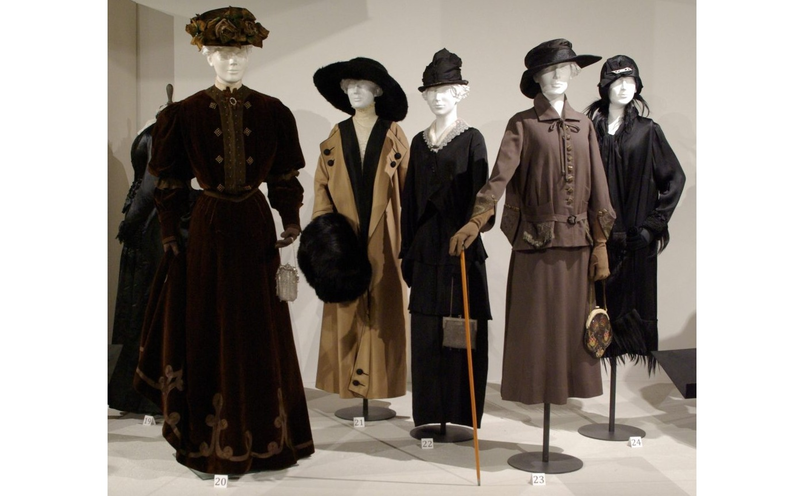 The nineteenth century is known for variety, ornamentation and rapid changes in women’s fashion. Undergarments such as corsets and bustles moulded the female body into ever-changing silhouettes. Procuring clothing for herself and her family was a considerable task for any woman, whether the sewing was done by hand, by a hired dressmaker, or, later in the century, by mastering one of the new sewing machines. In the 1830s, dresses were particularly wide. A dress worn by a member of the Reynolds family of New Brunswick shows this early fashionable shape, with its popular voluminous gigot-style sleeves. The crinoline or hoop skirt was introduced in the 1850s, changing the ideal form again — this time to include a bell-shaped shirt. The fashionable silhouette continued to change for women from the bustle, which perched at the back of the dress, to the smooth lines of an hourglass shape by the close of the century. As seen in a later dress belonging to a member of the Reynolds family — which had a peplum added to the bodice to maintain a fashionable look — middle-class Canadian women frequently had to modify their clothing to keep up with the trends. Costumed theatre, skating carnivals and fancy dress balls reached the pinnacle of popularity during the final quarter of the nineteenth century. The most popular costumes for fancy dress were historical characters such “Lady of the Time of Marie Antoinette” worn by Mrs. R.A. Lindsay (née Charlotte Vernon) to a Montreal fancy dress ball in 1881. There was great interest in achieving historical accuracy with these costumes, while still following the look of contemporary fashion. This dress, for instance, called a “princess-style dress”, which was sewn without a waistline, was popular in the 1870s. The costume incorporated the white wig and regal velvet sleeve detail one would associate with Marie Antoinette’s wardrobe. Mrs. R.A. Lindsay’s dress demonstrates how common it was to remake recently outmoded garments into fancy dress. Other costumes such as allegorical, literary and exotic characters were also popular. Fancy dress events were often themed to celebrate Canadian history or loyalty to the British Empire. As the fashionable silhouette changed, so did women’s outerwear and accessories. At times, styles of dress influenced the accessories that women wore. When Canadian women began to wear crinolines, for instance, their usual overcoats would no longer fit over their wide skirts. As a result, there was a growing interest in shawls, which could easily be draped. The Paisley shawl, first made in India, then in Scotland, was very popular and became a common household item. As the fashionable silhouette narrowed, the shawl was replaced with the visite, stole or jacket. Fans and parasols were often made of handcrafted materials. This fan , given to Annie Newson of Ottawa by her admirer Warren Soper around 1880, won her heart and led to marriage the following year. Given their unique and often one-of-a-kind character, accessories made special gifts. The Confederation Generation enjoyed an exciting time in the design of purses and handbags, due to a growing interest in travel, the invention of new dyes, and the availability of stylish decoration. This chatelaine, designed to be hung from the waist, was worn by Josephine McTaggart of London, Ontario and is a unique example of the vibrant reds, blues and golds then in use. Hats of all shapes and sizes were popular, particularly in the 1880s and 1890s, when hats mirrored the variety of layered fabrics found in skirts and dresses — as seen in the photo of a fashionable woman in Montreal. Millinery, or hatmaking, was a growing trade for women in cities across the country, and soon became completely distinct from dressmaking. As hats and bonnets became more than simply functional garments providing protection from the elements, millinery developed into an art involving the arrangement of a wide array of materials including ribbons, lace, flowers, feathers and sometimes even bird ornaments.